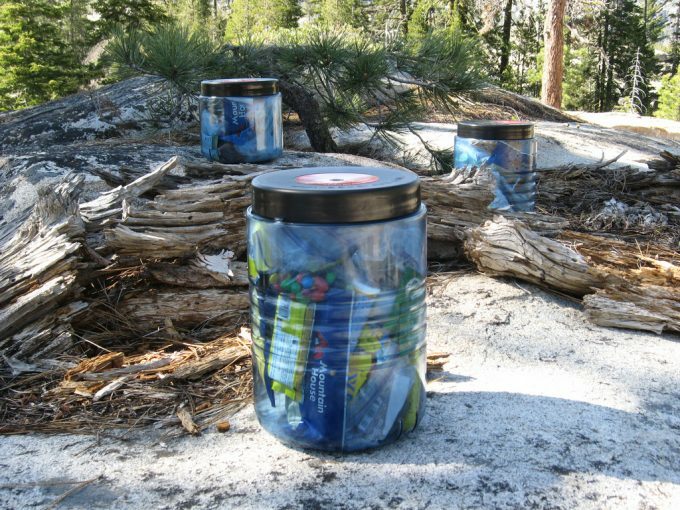 Avid hikers or campers can benefit from a bear canister, specifically those who live near the Pacific coast. It is easy to forget what is out in the wilderness when you are enjoying the sights and sounds. However, the sight of a hungry bear can scare anyone into leaving the wilderness for good. 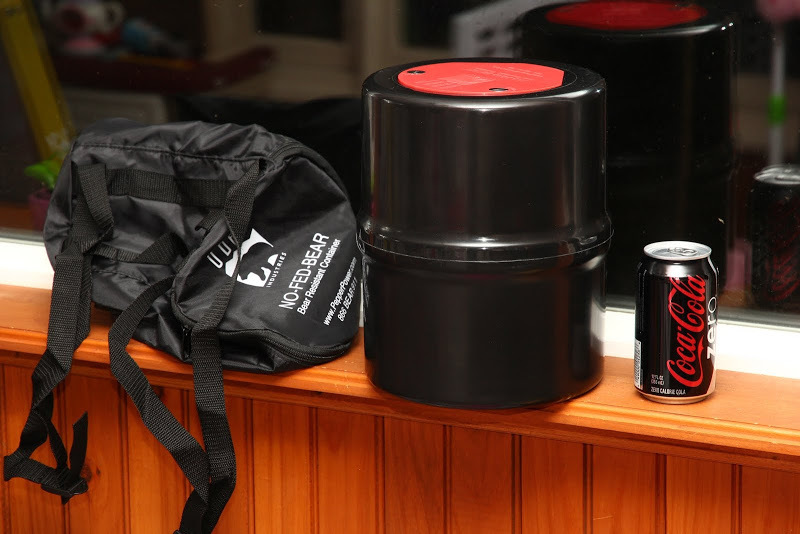 A bear canister is a bear-proof container. 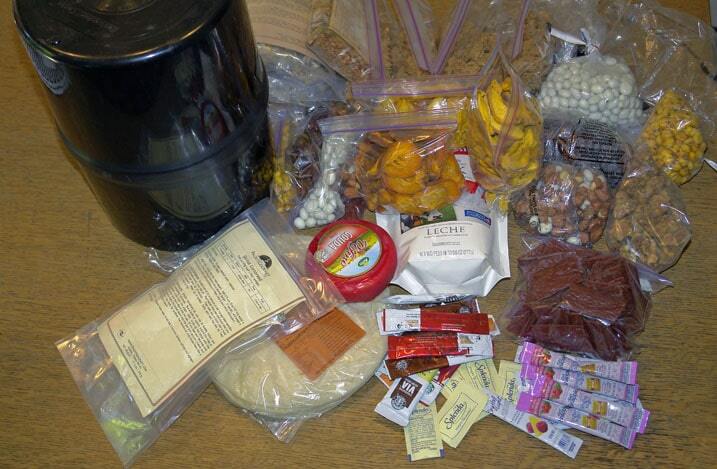 Hikers store all of their food and smelling items inside of it, which is typically stored inside of your backpack. 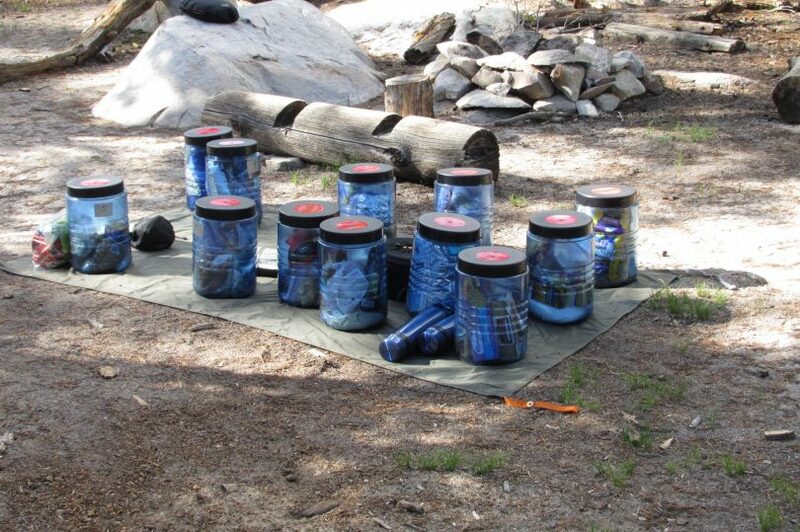 You can find them in a variety of materials, like hard plastic and carbon fiber but why not have a complete bear canister reviews to help you chose from? Taking along a bear canister can be an annoyance. They are rigid, bulky and take up a lot of valuable space. Some areas make it mandatory to use one. The benefits outweigh the annoyance and negatives. You could face a fine, and the bear can face the larger risk of having to be put down. Why risk the life of an innocent bear? Keep a bear canister with you at all times. You could just purchase the right one you find, but, instead, it is wise to read bear canister reviews. Users let you know the important pros and cons of the item from their personal experience. The reviews help you understand how you might successful use the canister in the food, while also giving you an insider’s view into the downfalls. 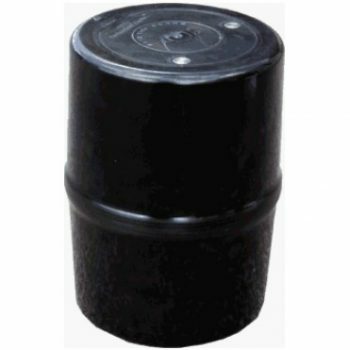 There are dozens of bear canister manufacturers and plenty of models by each company. Here is what you need to consider. You have to think about how much food you need to carry. Do you need food for one or two people? How long is your trip? There are containers meant for two to three days, four to five days, and 6 to 7 days. You can always buy more than one so that you have the right size for each trip, but it should be large enough for the longest period you plan to stay out. One of the negatives of any bear canister is the weight. They take up space in your backpack and weigh it down. So, you want the lightest possible container, empty, because it will weigh more once it’s filled with food. Some canisters weigh 2 pounds; some weigh more than 3 pounds. Opt for the lightest canister for the size you need. Some canisters are harder to open than others. You might need tools to open it. There are some that openly easily without tools. Transparent sides make it easy for you to find the food you want. There are some that have black sides. It is like searching in the dark abbess to find your snacks. Both black and clear sided canisters will heat up in the sun. The biggest thing to consider is how quickly you want to find food. Most canisters are hard sided, but there are some soft-sided models. Ursack has a canister made of bullet-proof fabric. A canister with soft sides weighs lighter than other models. There are some downsides like the bear can squish your food. The last important feature is the cost. Everyone has a budget range. You can find some in the $60 to $100. There are a few carbon fiber models that cost weigh more. However, there are plenty in a decent price range that will keep your food safe without costing a kidney. Based on bear canister reviews, we are going to go through some of the best options. The weight, dimensions, and material of each canister are highlighted, allowing you to eliminate the ones that don’t work for you quickly. Features: The BearVault offers 700 cubic inches, or 11.5 liters, of storage space for experienced hikers and campers. 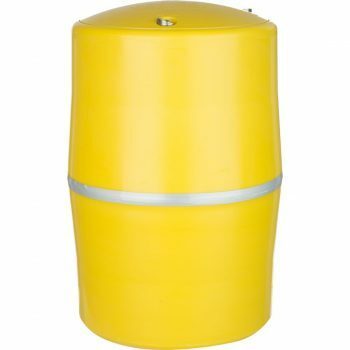 It is one of the best bear canisters available on the market. 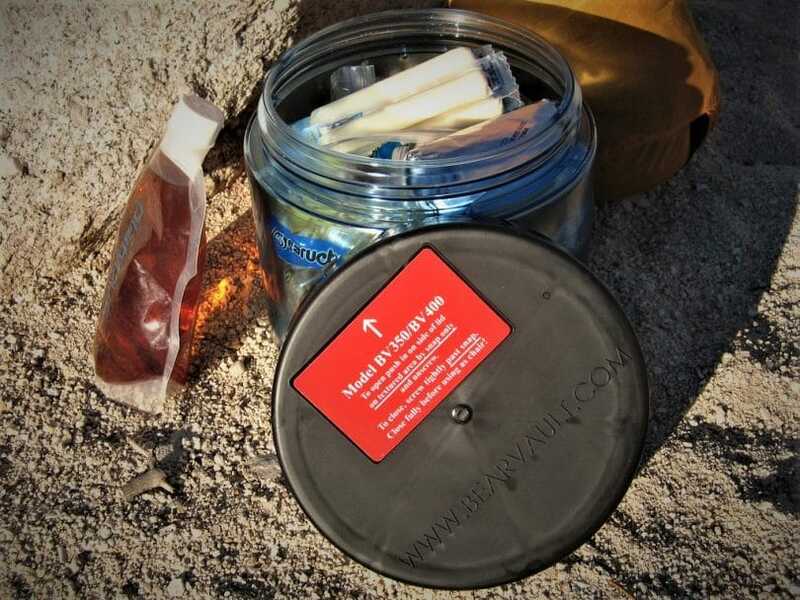 BearVault offers an innovative, patent pending opening lid that requires no tools to close or open the canister. Instead of using tools, all you need is a coin to unlock the top of the lid. Bears stay out, but humans can easily open it. They used transparent polycarbonate, which is a rugged and durable material. It can resist impacts and not shatter. 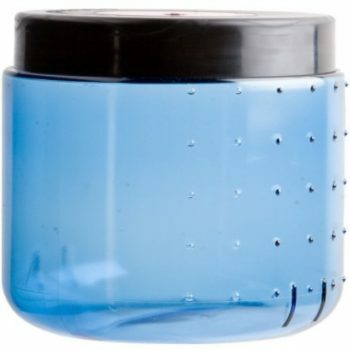 The canister itself is broad and rainproof, perfect for filling and emptying the jar. A wide opening also makes it easier to search for the best snacks. There are built-in guides so that you can use straps for the canister instead of an extra case for the backpack. When compared to our important features, BearVault is lighter than other choices. You could bring along around four days’ worth of food or two days of food for two people. You don’t need any tools to open the canister and the sides are clear, so finding your food is easy. Features: Many national parks, such as Glacier Bay and Yosemite National Parks, recommend the use of Food Cache Bear. It is one of the few containers approved by the DEC in the Adirondack peaks. It will keep all of your food safe. It provides 10.1 liters of storage. You can hold a small mess kit and enough food for two people for two days. Despite the size, you can fit nicely into a 50 or 65-liter backpack. A nice bonus is that you can use it as a stool at the end of the day. There is no reason to sit on the damp ground. When compared to our essential features, the Food Cache Bear is a good weight. You can carry between three to four days’ worth of food for yourself. It does require tools to open, but many national parks have certified the use of this container. So, you can feel confident that it is a valuable product. 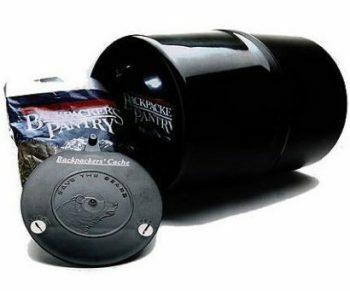 Features: The Backpacker’s Cache Bear Proof Container is meant to hold of most bears. The dimensions, 12 inches long by 9 inches in diameter, are too large for most bears to fit into their mouths. They used a strong form of plastic that is shatterproof, even if the bear can get it into its jaws. It has a black exterior with reflective piping around the middle to help you find it in the dark. One downside to the Backpacker’s Cache Container is that you need tools to open it. You will need to carry screwdrivers to open the lid each time. However, when properly tightened, it is tough for bears to gain access into the pack. Almost every national park recommends this canister, so you can use it if you plan to travel around from park to park without worrying. 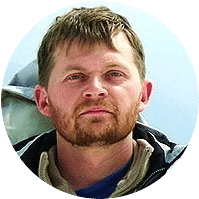 When it comes to the important features, the Backpacker’s Cache is heavier than other options and will hold around four to five days’ worth of food. 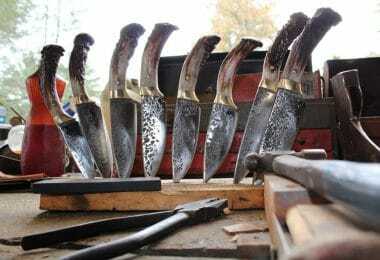 The material isn’t as durable as other choices, and you will need tools to open it up. However, it is durable and recommended by most national parks! Features: KleanKanteen is a well-known brand that creates high-quality food canisters and water bottles. They are leak-proof, airtight and shatter proof. 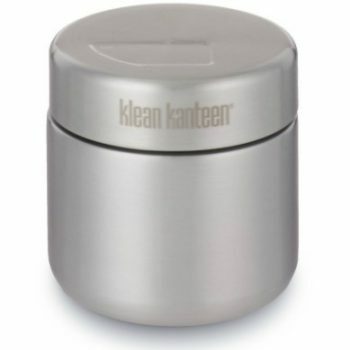 KleanKanteen used 18/8 food-grade stainless steel with a 100 percent stainless steel interior. The material won’t retain any scents or flavors. It is important to note that these are not labeled as bear canisters. 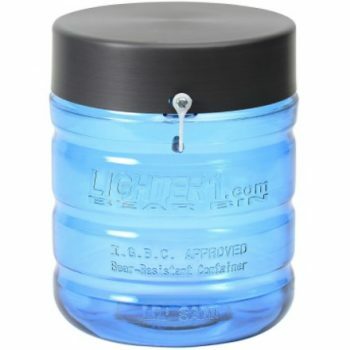 They are labeled as food canisters, available in either 8 or 16 ounces. These canisters are single walled, not intended to keep your food hot or cold. However, you can easily fit enough food for a one day hike inside of it, especially if you opt for the 16-ounce canister. When it comes to the important features, the KleanKanteen is very lightweight, but it isn’t an actual bear canister. 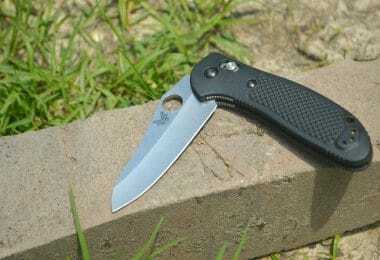 The material is stainless steel, durable and reliable. You could store a day’s worth of food, but it isn’t ideal for long trips. The best part of this canister is that it is leak-proof and shatter proof. Features: The Lighter 1 Lil’ Sami is a smaller version of the very famous Big Daddy. It has half of the capacity of it, but still provides an enormous amount of storage space. You can store 5 liters of food and items in the canister. One noticeable feature is the shape; it is more cylindrical than other brands. You might find it easier to pack, especially if you are good at organization. When compared to the important features, the Lil’ Sami is lightweight! It can store around two to three days’ worth of food. The materials are durable and reliable. It is perfect for packing due to its shape. However, it is costly, and you could get the bigger size for just a few more dollars! But, if you want a lightweight choice, you can’t go wrong with it. Features: Counter Assault is a company based out of Montana, and their Bear Keg is one of their best-sellers. It is the newest model made with a very durable material. Proprietary Polymer Blend is durable and made with a highly visible color – bright yellow! You can store six to eight days’ worth of food, with 716 cubic inches (3 gallons) of storage space. 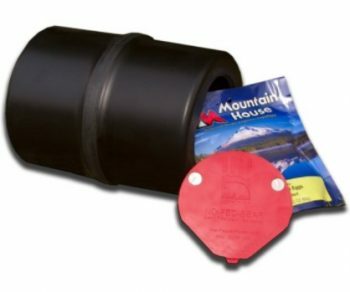 The Bear Keg is certified to use in all national parks and meets all United States Forest Service Specifications. The canister can withstand 250 pounds of pressure! To open the lid, you can use a key or a coin to unlock three latches simply. When compared to the important features, the Bear Keg is HEAVY. If you are traveling solo, it may be silly to bring it along. However, if you are going with a group, it is an excellent choice instead of bringing multiple canisters. It is easy to open, but the sides aren’t transparent, so finding the food will take some time. Features: The No-Fed-Bear is a straightforward and durable container. 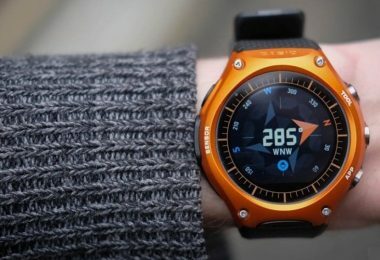 It isa good choice for weekend hikes or camping trips in the woods. This canister is budget friendly, a feature many people need. The lid is flush with the container, making it hard for bears to find any leverage to open it. You will need a coin to loosen the screws. One of the best reasons to the use the No-Fed-Bear canister is the size. Weekend trips typically require less packing, and this container fits in most small sized backpacks. Despite the small size, it is strong. UDAP used heavy duty, plastic polymer. When compared to the important features, the UDAP is lighter than a few of the other canisters. It is budget friendly and requires no tools to open. It is ideal for weekend trips, with strong materials. Reading bear canister reviews is important! Hikers and campers have so much great insight into what works for them. These canisters all have some impressive features. It is most important for you to check out the size and how much it holds. Think about your plans and how much food you need to take along. Remember, while they may seem like a pain in your back, bear canisters are meant to protect you and bears. They are a requirement in many national parks, so always check the laws before you head out. Ultimately, they are a small price to pay to protect the lives of the precious animals roaming our nation.